I grew up in a little village called Abbots Bromley in east Staffordshire. 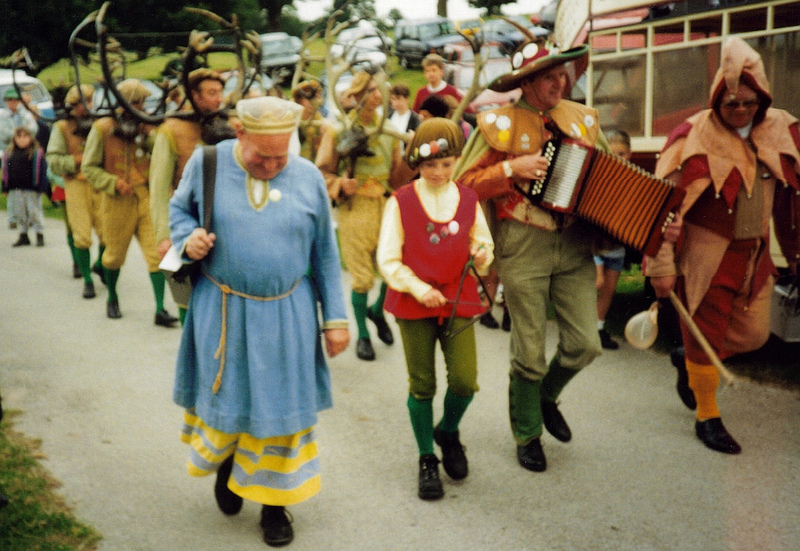 Every September the village hosts a peculiar custom, the Horn Dance, which involves a Maid Marion, a hobby horse, a child with a triangle and a cluster of men who parade around the parish with ancient stag horns on their head. The custom can trace its roots back for centuries. Here is a snippet about the dance from a nineteenth century journal. There are some curious circumstances attached to Abbots Bromley, which derived its name from an abbey that formerly existed in the neighbourhood, and was subsequently called Paget’s Bromley, from the family of that name. The church is spacious, and has a tower, from which rises a lofty steeple. Mogg observes that ‘the custom called the hobby-horse dance formerly prevailed here; it was generally celebrated at Christmas, on new year’s day, and twelfth day, when a person carrying between his legs the resemblance of a horse, made of thin boards, danced through the principal street, having a bow and arrow in his hands, the latter of which passed through a hole in the bow, and stopping it on a shoulder, made a snapping noise, when drawn to and fro, by which means he kept time with the music.